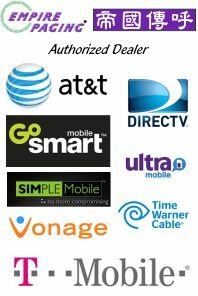 We have a huge selection of wireless carriers, cell phones, and accessories from which to choose. We want you to find the right product for you. We’re helpful experts, not pushy salespeople. Our customer service representatives are friendly, professional, and ready to assist you. You’ll get the same great rate plans from the carrier you select regardless of where you buy. But, when you buy from Empire Paging, you will get a better phone at a better value than you will walking into just about any other retail store. Empire Paging offers our own exclusive rebates.Plus, our rebates have easier rules and redemption policies than those of our competitors. Best of all, we have solid reputations for 24 years in retail business. Empire Paging will be your best communication choice.